A suicide attacker has detonated a bomb on a bus in Baghdad, killing at least 30 people, Iraqi police said. 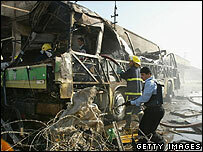 The vehicle was leaving al-Nahda bus station heading south for the Shia town of Nasiriya when the attack occurred. Witnesses said the bus was gutted and left in flames by the explosion. Another 25 people are reported injured. Iraq has been bracing for an increase in violence by anti-US insurgents ahead of the election next Thursday for the first full-term post-Saddam parliament. Two food and drinks stalls were destroyed by flying shrapnel and their gas cylinders exploded. Reports say some passengers were trapped as fire swept through the bus. "I was standing near when the blast happened. I saw only seven or eight people wounded and all the remaining people inside the bus were killed," said one man. Police believe the attacker waited until the bus was pulling away slowly from the station and jumped on board to avoid security checks. "[The conductor] tried to stop him but the man insisted. He sat in the middle of the bus and then the explosion took place," said a police spokesman. Four months ago the station - which serves various parts of the country including the mainly-Shia south of Iraq - was hit by a triple car bombing which killed at least 43 people and wounded 89. On Monday, two suicide bombers killed at least 36 police and cadets at a Baghdad police academy. In other violence, a US soldier was killed when a roadside bomb hit a military convoy in eastern Baghdad.